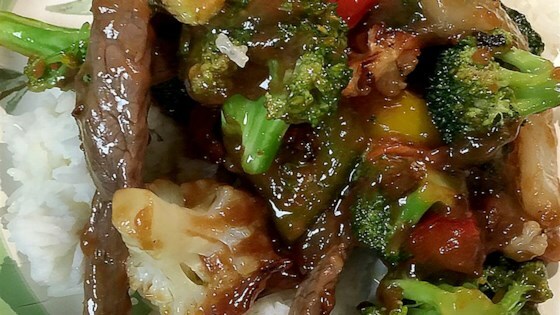 "A beef stir-fry that has wonderful flavors without using a ton of spices. Fresh ginger mixes will with the soy sauce and makes a quick and easy sauce. Lots of veggies add color and crunch." Bring brown rice and water to a boil in a saucepan over high heat. Reduce heat to medium-low, cover, and simmer until rice is tender, and liquid has been absorbed, 45 to 50 minutes. Combine cornstarch, sugar, soy sauce, and wine in a small bowl until smooth. Stir in ginger; toss beef in sauce to coat. Heat 1 tablespoon oil in a large skillet over medium-high heat. Cook and stir broccoli, carrots, pea pods, and onion for 1 minute. Stir in water chestnuts, Chinese cabbage, and bok choy; cover and simmer until vegetables are tender, about 4 minutes. Remove from skillet and keep warm. In same skillet, heat 1 tablespoon oil over medium-high heat. Cook and stir beef until desired degree of doneness, about 2 minutes per side for medium. Return vegetables to skillet; cook and stir until heated through, about 3 minutes. Serve over rice. Try using apple juice or water instead of white wine. I substituted Brown Sugar, and added a touch more ginger. Tastes wonderful, rivals any savory beef stir fry recipe! This will definitely become a staple recipe in our house!